this is the reason why I have slight wrinkles as I age. It really disappoints me because flaws in my face are threats for me. I think of it as something indication of problems. I don’t want people to think of me that way. Anyway, my experience with wrinkles around my eyes is sort of premature and I am too young to undergo cosmetic surgery. 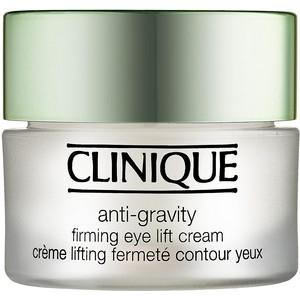 Then my own aunt recommended to me Clinique Anti-Gravity Firming Eye Lift Cream. wrinkles beneath my eyes were gone. You know when you constantly smile and the skin near your eyes wrinkles and eventually it marks as a wrinkle, this is the main problem I had but when I started using this Anti-Gravity eye cream, the fine lines started to disappear. In as little as 12 days since the first time I tried it that I notice good progress in the renewed appearance of my skin beneath my eyes. side effect when I used it. The product is pure and totally applicable for sensitive skin. In case you have sensitive skin, you won’t have any problem and this assurance is taking from the cue that Clinique cosmetics are all allergy tested. appropriate to use. The products of Clinique have undergone high standards of research and test before this was released in the market thus giving us assurance of best ingredients for our skin. The product in surely effective because not only it produces positive results in the quickest times, it also prevents the wrinkles from coming back. The constant hydration that is brought about by this eye cream is the long term healing that is offered. In my case, I am worry free about the wrinkles in my eye area.